Mac users everywhere--even those who know nothing about programming--are discovering the value of the latest version of AppleScript, Apple's vastly improved scripting language for Mac OS X Tiger. And with this new edition of the top-selling AppleScript: The Definitive Guide, anyone, regardless of your level of experience, can learn to use AppleScript to make your Mac time more efficient and more enjoyable by automating repetitive tasks, customizing applications, and even controlling complex workflows. Fully revised and updated--and with more and better examples than ever--AppleScript: The Definitive Guide, 2nd Edition explores AppleScript 1.10 from the ground up. You will learn how AppleScript works and how to use it in a variety of contexts: in everyday scripts to process automation, in CGI scripts for developing applications in Cocoa, or in combination with other scripting languages like Perl and Ruby. AppleScript has shipped with every Mac since System 7 in 1991, and its ease of use and English-friendly dialect are highly appealing to most Mac fans. 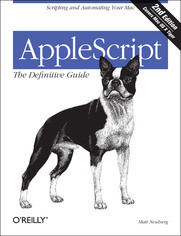 Novices, developers, and everyone in between who wants to know how, where, and why to use AppleScript will find AppleScript: The Definitive Guide, 2nd Edition to be the most complete source on the subject available. It's as perfect for beginners who want to write their first script as it is for experienced users who need a definitive reference close at hand. AppleScript: The Definitive Guide, 2nd Edition begins with a relevant and useful AppleScript overview and then gets quickly to the language itself; when you have a good handle on that, you get to see AppleScript in action, and learn how to put it into action for you. An entirely new chapter shows developers how to make your Mac applications scriptable, and how to give them that Mac OS X look and feel with AppleScript Studio. Thorough appendixes deliver additional tools and resources you won't find anywhere else. Reviewed and approved by Apple, this indispensable guide carries the ADC (Apple Developer Connection) logo. 1.2. Is This Application Scriptable?